The “hope” and “change” platform that President Obama ran on in the 2008 election has proven to be much about change with the expectations of a hopeless future. Between his government bailouts, cap & trade and potential government health care, I feel like our federal government has no concept about how the national debt is increasing (if you are interested, click here). However, there are a few occasions for laughter in the midst of each day’s economic bad news. Here is a video that fits the Obama view of government. Though I laugh for a moment at this video, the US’s fast slide into an economic abyss concerns me. The following outline reflects that there are three major movements in Job. The summary statement for each movement reflects how it relates to the subject being addressed in this book. The secondary divisions for each movement have been derived from the eight points in the above chart reflecting the book’s development of thought. The tertiary subdivisions are basically derived from the Joban author’s narrative introduction to each unit of material. 1. The Preliminary Conflict Generates Man’s Questioning of God’s Administration of Justice, 1:1–2:13. This describes the temporal setting, location, and circumstances of this story. In describing Job as a genuinely godly man, this lays the foundation for the tension portrayed in this book. This unit of material gives an account of the testing of Job. The action moves back and forth between heaven and earth. This material is relevant for the following argument. We see that God initiates the conversation with Satan. This dialogue focuses on the genuinely righteous character of Job. Satan in response challenges God’s view of Job. In order to vindicate Himself and Job, God permits Satan to test Job. 2. The Conflicting Debate Reflects Man’s Misunderstanding about God’s Administration of Justice, 3:1–37:24. Job’s friends came to comfort Job. They said nothing for seven days and seven nights. Job is the first to speak. In this speech Job curses the day of his birth. This reflected an incorrect attitude towards God’s gift of life. Job’s complaint was improper behavior for his friends and it confirmed to them that Job had to be suffering on account of his sinfulness. This is what creates the tension and initiates the conflict. The three cycles of debate between Job and his three friends magnify the conflict and make any solution to the conflict appear impossible. The friends’ remarks to Job become progressively shorter and in the third cycle of speeches Zophar does not even respond. This reflects that Job’s friends had been defeated. Since the wise men of Job’s day could not refute him, this creates a tension. Is anyone able to answer Job? Job’s discourse on wisdom indicates that only God has wisdom; yet Job challenges God to a legal conflict by giving his oath of innocence in chapter 31. This is where the conflict reaches its peak. 3. The Divine Response Encourages Man’s Submitting to God’s Administration of Justice, 38:1–42:17. All the human answers have been given to solve Job’s problem; however, none have provided the solution. The only one who can unravel this is God. In this section of material, God provides the resolution to the problem. This is the consequence of the resolution. God pronounces that Job was right in the debate and that God will only accept Job’s prayer for his friends. The Joban author gives his concluding remarks about the account. In the end, he announces that God freely blessed Job with greater blessing than his earlier years. With my final post, I will suggest some themes from Job and units for a series of expositional sermons on Job. Though President Obama and Congress may take the health care issue and give us what we do not want, now is the time for us to do our best to let our national leaders know that we are opposed to this type of reform and, if they do not listen, then there are the elections in 2010. In my previous post, we looked at the misguided applications of God’s administration of justice. All the human participants, Job’s three friends, Elihu and Job had their own deficient interpretations about how God controls the moral order of the universe. The stage is set for God to speak ex cathedra. With this post, we will initially look at the divine interpretation of God’s administration of justice. 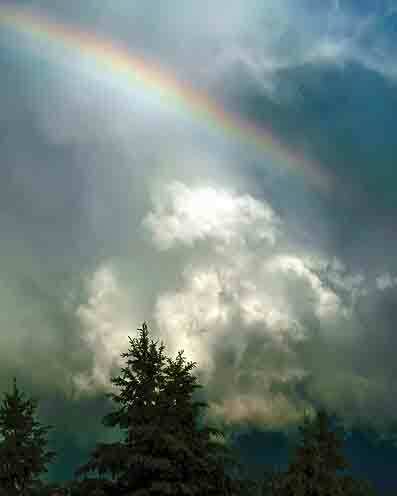 Rather than responding to Job’s demand for a legal hearing, God appears in a storm. Rather than discussing Job’s innocence or how He administers justice, God overwhelms Job with questions about His creation and management of the world. God says nothing directly about His control of the moral order of life as it relates to Job’s suffering and questions. God’s questioning of Job reflects that He, as the Creator and Sustainer of all creation, is working everything according to the wise perfections of His infinite design. Job must be content with recognizing that he cannot begin to fathom how God controls the details of the moral order of life and with his salvific knowledge of the Almighty. In both speeches the LORD challenges Job’s anthropocentric view of the moral order of life and substantiates a theocentric perspective. Each speech will briefly be presented. 1. The LORD’s control of the universe is beyond anyone’s comprehension (38:2–40:2). God initiates this speech with an accusation against Job in 38:2. The point of this is that Job has darkened the LORD’s counsel with words spoken in ignorance. The LORD concludes this speech with the same type of accusation in 40:2 where He questions Job concerning the validity of his desire to legally contend with Him. God is reflecting with each accusation that Job does not comprehend His plan and work. In demonstrating His accusation about Job’s lack of wisdom, God raises a series of rhetorical questions. These can be broken down in a threefold manner: God’s creation of the world in 38:4–11, His sustenance of the world in 38:12–38, and His management of the animal kingdom most of which were undomesticated in 38:39–39:30. The point of these is to demonstrate that Job is unable to comprehend what God is doing because he is not God’s equal. God in His freedom as an all-wise and all-powerful Sovereign had created and is sustaining His creation. This is a God-centered world in contrast to a man-centered view as advocated by Job in his ignorance as well as his fellow wise men. 2. The LORD’s administration of justice is beyond anyone’s comprehension (40:7–41:34). Like the first speech, God makes another accusation in 40:8 against Job. With this accusation Job is accused of having discredited the LORD’s justice, condemning God to justify himself. As such, the LORD’s last speech does relate to His administration of justice; but it is not in the manner that either Job or his friends had expected. After this accusation, the LORD challenges Job in 40:9–14 to take over God’s place and to execute retributive justice on the wicked. God then returns to continue questioning Job in reference to His control of the animal kingdom. His questions focus on two of the wildest animals in Job’s day, behemoth and leviathan. God uses both creatures analogously to demonstrate to Job that His administration of justice is beyond Job’s comprehension. The LORD challenges Job to look at behemoth (interpretations that I see as possible include a hippopotamus, an elephant or a dinosaur) in 40:15–24. The point is that Job himself could not readily control behemoth. God reminds Job in the middle of the speech, v. 19, that He has behemoth completely under His control. God concludes this speech with a challenge in v. 24 reminding Job of his inability to subdue behemoth. When we compare v. 24 with v. 19, God is stressing that Job was unable to capture behemoth (v. 24), yet God has him completely under His control (v. 19). We should compare these two verses with vv. 8–14. If Job cannot govern behemoth, how could he hope to humiliate all the proud ones of this earth (vv. 11–14)? If he can do neither, how can he question God’s administration of justice (vv. 8–9)? Thus Job should forget his request for vindication and completely submit to the LORD and His control of this world. The LORD challenges Job to subdue leviathan (possible interpretations include a crocodile or dinosaur) in 41:1–34. God reminds Job in v. 10 that he was not fierce enough to arouse leviathan and, therefore, how could he hope to come before God with His claim. This is developed further in v. 11 where God highlights that He owns everything. Because of this, God does not have to respond to any created being’s claim against Him. In vv. 33–34 God brings this speech to a conclusion. Using personification, God describes leviathan as a unique creature. As such leviathan had no equal on earth. Being fearless, no creature could intimidate leviathan, v. 33. God further describes leviathan in v. 34 as looking down on all other creatures. As such, he is king over all the haughty including Job since Job could not approach him with a bridle (41:5). The a fortiori argument is this, if leviathan is king over all the proud including Job, how much more so is his Creator, the Sovereign Lord of the universe. If Job is unable to capture or control either behemoth or leviathan, then how could he hope to take God’s place in administering justice? God never tells Job how he exercises justice. This was impossible since God’s control of the moral order of this life was beyond Job’s creaturely comprehension. The LORD’s administration of justice is beyond any created being’s understanding. Though Job does not have the issue of justice explained, he does learn that this is too profound for him and that he must submit to the Sovereign God who administers justice in perfect conformity with His nature and plan. What then is the overall message of the book of Job? I would summarize it like this. Because of God’s incomprehensible wisdom and incomparable power as reflected by His creating and sustaining the world and its inhabitants, He is its sovereign who freely administers justice correctly. With Job’s fuller revelation of the theocentric nature of the world, he repented of his wrong and fearfully submitted to the Almighty. In short, the mysterious nature of God’s control of life’s moral order should produce in his people a repentant faith in God and a wholehearted reverence for his sovereign majesty. With my next post, I will develop a structural scheme for Job with annotated outline. Last night I saw an interview where Megyn Kelly went after White House Press Secretary Bill Burton. The Interview dealt with the White House keeping an “enemies list” when somebody has a concern about someone who is dispersing misinformation about Obamacare. When you hear this misinformation you can “rat” on this person by sending this information to flag@whitehouse.gov. The problem is that these emails are not deleted. They are saved and they have the potential of being used in the future. The ramifications of this practice are frightening. Check out this video and see what you think. May be we are moving into Orwell’s Oceania? What is the message of Job and how does this relate to the issue of suffering? Rather than viewing Job’s suffering as the central focus of the Joban author’s argument, as I suggested in my introductory post, a case may be made that Job’s suffering serves as a catalyst to explore God’s control of the moral order of life, his administration of justice, and the impact that this exploration has on Job (see Clines, Job 1-20, pp. xxxix–xlvii). The divine administration of justice refers to God either blessing a person for living righteously, remunerative justice, or judging a person for living wickedly, retributive justice. In 1:1–5 Job is pictured as having a genuine righteousness with the consequential blessings of an ideal family, wealth, health, and a good reputation. Job was living proof of God’s remunerative justice. However, in 1:6–2:10 Job’s life of blessing is quickly changed into one of severe suffering. Furthermore, the immediate context of Job is clear that Job’s suffering was not produced because of a lifestyle of sin (see 1:8, 2:3). This situation challenges Job’s understanding of this dogma of God’s administration of justice. Job wants another explanation of how the moral sphere of this life is governed. Even his friends also find their understanding challenged. However, they tenaciously cling to their interpretation of God’s administration of justice (for a good exposition of the entire book of Job, see Estes, Handbook on the Wisdom Book and Psalms, pp. 28-128). In this post, I will examine the various misguided applications of God’s administration of justice and, in the next post, the divine interpretation of God’s administration of justice (for a concise and helpful discussion of Job’s message, see Wilson, “Job,” in Theological Interpretation of the Old Testament, pp. 150-52). Satan, Job’s friends as well as Elihu, and Job have various misguided applications of God’s administration of justice. I will summarize each of these. 1. God’s administration of justice is inherently flawed. This is the view of Satan. After having roamed the earth, Satan presents himself before God. God asks him in 1:8 if he had found anyone on earth as upright as Job. In response to this, Satan raises a question about God’s administration of justice. In 1:9–11 Satan asserts that if God would remove Job’s blessings, Job would curse God. This is to say, Job is righteous because God has rewarded him. The implication is that God’s system of justice does not promote genuine righteousness. Man serves God for His blessings and not for true devotion to God. With God’s permission, Satan then removes God’s blessings from Job. Job loses his ideal family (with the exception of his wife), wealth, health, and even his reputation is questioned. Satan’s goal is to get Job to curse God. By doing this, Satan will demonstrate that God’s moral order has an intrinsic defect. 2. God’s administration of justice is mechanically applied. Job’s three friends and Elihu share a common belief that God mechanically rewards and judges people for their actions. This was an immediate cause and effect understanding of God’s administration of justice. This is demonstrated by their acceptance of the corollary of retributive and remunerative justice. The corollary of the former is this: if one is suffering, he had to be living in sin; and the later: if one was prospering, he was living righteously. In each case the degree of results was directly proportional to one’s behavior. Prior to Job’s suffering, the friends viewed Job as living proof of the corollary of remunerative justice; however, after the extreme disasters that Job encountered, he was definitely living in extreme sin but apparently not extreme enough to have his life taken, as his children’s lives had been (see 4:7–9; 8:3–4; 11:4–6). 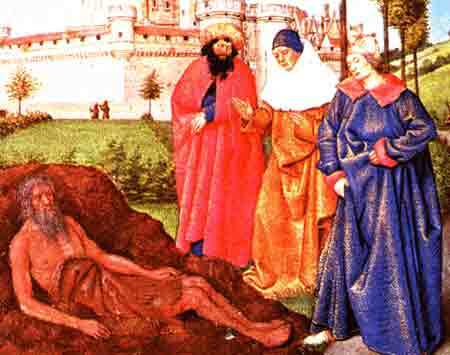 The three friends and Elihu agree that Job was suffering because of sin (see 4:7–9; 8:3–4; 11:4–6; 34:11–12). They also agree that God will reverse Job’s suffering if he presents his appeal to God or confesses his sin and lives righteously (5:17–27; 8:5–7; 11:13–20; 34:31–32). However, they diverge somewhat in their understanding of the significance of Job’s suffering. The first response to Job’s curse on the day of his birth is by Eliphaz. He assumes in his first speech that Job’s sin is minor and that he is basically an innocent man. In 4:3–6 he recognizes that Job is a blameless man who is suffering. This is a problem to his theology. His solution is that even one as righteous as Job will suffer deservedly at times, 4:17–19. He also assumes that Job’s suffering is minimal and may be quickly removed (4:7). He further postulates in 5:17–27 that God uses suffering for correction purposes. The second responder, Bildad, is convinced that God has appropriately administered justice to Job and his family. He views Job as being sinful and deservedly suffering but not so sinful that God had to immediately take his life, as He had to do with his children, 8:2–4. 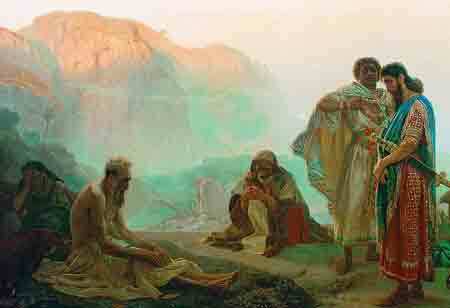 The third reaction is by Zophar who is convinced that Job is a hypocritical sinner. Since Job claims that he is clean in God’s sight (11:4) and he is greatly suffering, Job must be concealing sin. For Zophar, God’s retributive theology was not quid pro quo since God has mercifully overlooked a portion of Job’s sins (11:5–6). If the truth had been revealed, Job was a greater sinner than any of his friends could have imagined. When the friends’ argumentation against Job becomes ineffective with them becoming silent, another participant, Elihu appears in 32:1–37:24. Like Job’s three friends, Elihu is a defender of God’s justice. Because he also accepted its corollary, he assumed that Job was suffering because of sin (33:27; 34:11–12, 31–33, 37; 36:8–10). In my understanding of Elihu, he plays the role of an adjudicator in the book (so also Estes, pp. 104-5 and Wilson, p. 151; for a more thorough defense of this view, see my article, “Elihu’s Contribution to the Thought of the Book of Job“). Though Eliphaz had postulated that God used suffering for purposes of correction, Elihu more thoroughly develops God instructional use of suffering in 33:19–28 and 36:8–12. For Elihu suffering was not only for retribution but also for correction. 3. God’s administration of justice is capriciously interpreted. Until he had experienced his intense suffering, Job agreed with his friends about God’s moral order. However, he has changed his mind. Since he is living righteously yet suffering, he is confused and looking for other explanations as to how God administers justice. Job’s initial response to his calamities is a calm acceptance of these as God’s will for his life. After further prolonged reflection over a period of months (7:1–6), he realizes that his understanding of the moral order of life has collapsed. While Job’s arguments in the midst of his suffering reflect the marks of a genuine believer, such as Job 19:25–27, Job nevertheless makes some wrong accusations against God. I will summarize Job’s argumentation and then note some of these wrong accusations. In examining Job’s thought, I will organize this summary around the sequential development of his speeches. In his first speech in chapter 3, Job’s complaint provides the occasioning incident for the friends to speak. Job reacts to his situation by wishing that he had never been born. Since this wish is impossible, he pleads with God to kill him in his second speech (6:8). In Job’s third speech, he moves beyond his death wish and desires a declaration of innocence (9:2–3). In the heat of defending his reputation, Job accuses God of being hostile to him (9:8) and of oppressing him while smiling on the plans of the wicked (10:3). Because of God’s posture toward him, Job realizes that God will never give him what he feels is his right, viz., a declaration of innocence (9:14–20). Job’s thought develops further in that he feels that with an arbitrator it might be possible for him to enter into litigation with God (9:32–35). Job’s desire for a court hearing with God grows stronger in his fourth speech for he requests a legal hearing with God before he dies (13:3, 16–19; 14:13–17). In his fifth and sixth speeches, he again wishes that an impartial mediator would serve as his defense attorney before God (16:18–22; 19:25–27). Job is convinced of his innocence and is confident that God will vindicate him, even if it is not in the present earthly sphere. Though Job is suffering in a most profound way as well as limited by his finite knowledge of God’s ways and by his frustration over his friends’ false accusations, his focus on God as a solution to his suffering demonstrates the reality of God’s salvific work in his heart. However, Job’s conviction of his innocence prompts him to accuse God of having wronged him (19:6). In his seventh speech he ponders God’s system of justice in light of God permitting the wicked to live happy and long lives (21:7–26) and permitting them to even be buried with honor (21:27–34). Job is confused about God’s moral order. However, he is still convinced that he wants no part with the counsel of the wicked since they do not recognize that God is the ultimate source of their blessing (21:16). In his eighth speech, Job observes some enigmas in God’s moral order (24:2–21). Yet Job is convinced God will rectify these enigmas (24:22–25). Job’s quest for the vindication of his integrity moves him in his ninth speech to declare that God has denied him of his justice (27:2). However, he subsequently balances this out by affirming that God will judge the wicked (27:13–23). In the midst of Job’s confused and proud challenges, he again shows the marks of one who has been internally renewed by God. sufficient wisdom to solve some of the problems in the world, only God has this type of wisdom (28:20–28). After reviewing his earlier state of blessing (29:1–25), he then ridicules those who have attacked him (30:1–15) and affirms that God has attacked him and refuses to respond to his requests (30:16–26). Job’s conviction of his innocence and of God’s justice compels him to take an oath of innocence in chapter 31. Job’s oath is a naïve challenge to God’s moral order. If Job is innocently suffering, divine justice appears to be in error. In Job’s desire to go to court with God, he is attempting to approach God as an equal. Though Job believes that God does have a system of justice, he is in effect accusing God of using it capriciously. While I have noted that Job shows the marks of divinely produced new life, he nevertheless made some ignorant charges against God. God highlights these charges by accusing Job of speaking out of ignorance in 38:2, of making false accusations against Him in 40:2, and of discrediting His justice in 40:8. Because of God’s accusations against Job, we will note three of Job’s false charges. 1) God has mistreated Job. In 10:3 Job accused God of oppressing him while smiling on the plans of the wicked, in 16:9–12 of attacking him in anger, in 19:6–11 of wronging him and counting him as his enemy, in 27:1–2 of denying his justice, and in 30:19–21 of ruthlessly mistreating him. 2) God was not taking care of other suffering people. This is to say, God was not doing His job as ruler since he allowed the widow, the orphan, the poor, and the needy to be oppressed by the wicked, 24:1–12. 3) God arbitrarily governed the moral sphere of life. By accusing God in this manner, though done in ignorance, and by desiring, consequently, to enter into litigation with God, Job was in effect passing judgment on God and, therefore, making himself out to be God’s equal (pride). In effect, Job was maintaining that God capriciously administered justice. In response to Job and his friends, there is only One who is able to speak ex cathedra on the administration of justice, but His response will have to wait until my next post. I am going to do a five-part series on the book of Job’s message for today. This is an update from a 2004 workshop that I did at the Mid-America Conference on Preaching. This initial post will serve as an introduction to the series. After this, I will do two posts on the message of Job, another on a structural outline of Job, and finally recommended themes with suggested units for an expositional series on Job. I do not personally know of any pastor who has preached through Job in a verse-by-verse manner, though I suspect there may be a few who have tried. And, a verse-by-verse series on Job is not the expositional approach which I will support in this series. In reality, I have more commonly heard of sermons being preached about Job’s faith in his Redeemer in 19:25 or his unwavering faith after overwhelming tragedy in 1:6–2:10. Sermons on isolated texts tend to present Job as a man who esteems God above family, possessions, and health. With this understanding, the man Job is used as a model of “patience.” Yet, if we read beyond chapter two of Job and a few isolated verses, the picture of the patient Job is darkened. As a cursory reading of the entire book of Job reflects, the Joban author preserves a view of Job that may be construed as a “divided man.” Perhaps, this polarized view of the man Job contributes to a paucity of sermons on the book of Job. It is very rare to hear a message on chapter three of Job where he curses the day of his birth. Conceivably, this paucity is because Job in 3:1-26 reflects a wavering faith that is the antithesis of his faith in chapters one and two. Undoubtedly, the oversimplified picture of a “patient” Job is incorrect. The picture of Job becomes even more confusing in the heated three rounds of debate between Job and his three friends, Eliphaz, Bildad, and Zophar (4:1–27:23). One might misconstrue Job’s defense against his three friends as a proclamation of being “sinless.” At the minimum, he sounds like an extremely distressed believer. However, the picture of Job is even bleaker in Job 31. Job is so convinced of his innocence that he claims if possible he would wear on his shoulder an oath of his innocence and approach the Almighty “like a prince” (31:37). At this point, Job may sound like an unbeliever. As Job meditates on his great suffering, the Joban author presents him as something of a spiritual “schizophrenic.” To preach on the patient Job at the neglect of his impatience or on his positive affirmations of faith at the exclusion of his seemingly critical statements about divine justice is to distort the message of Job. Yet, it is the struggling Job who is a key figure in the development of the message of Job (Davis, “Preaching from Job,” Southwestern Journal of Theology 14 [Fall 1971]: 65). Does Job esteem God above his gifts? Or does he prize the gifts more than God? How does Job’s struggle relate to God’s sovereign control of the moral order of life? Beyond the inability to integrate the struggling Job with the stalwart Job, it is difficult to understand how the book ties together as a whole. There is no evangelical consensus about the literary structure of Job or its essential argument. Furthermore, the Hebrew in this book is considered the most difficult in the Old Testament, with more than a hundred words that are used either once or twice in the Hebrew Old Testament. In addition, Job’s candid and constant questioning of divine justice is difficult to harmonize with God’s own estimation of Job: “a blameless and upright man, fearing God and turning away from evil” (1:8; 2:3). Job raises hard philosophical and theological issues to which God does not directly respond in the conclusion of the book (Parsons, “Guidelines for Understanding and Proclaiming the Book of Job,” Bibliotheca Sacra 151 [October–December 1994]: 393–94). These types of issues may be an impediment for understanding the Joban author’s argument and, consequently, encumber expositional preaching from Job. Habel has compared the difficulty in preaching on Job with a cactus garden: “Preaching from Job is like nurturing a cactus garden. One is liable to recoil from constant prickles and miss the blossoms in the night” (Job, p. 1). While Job presents numerous difficulties, one facet of the book’s message is lucid: the intense nature of Job’s suffering. As a result of the clarity of this aspect of Job, many interpreters have understood that the message of the book of Job is primarily dealing with the subject of the righteous suffering. However, this approach is myopic for the suffering Job is neither told who was immediately responsible for his suffering nor the reason for his suffering (see Wilson, “Job,” in Theological Interpretation of the Old Testament, pp. 150-52). What then is the message of Job and how is his suffering integrated into this message? I will address the issue of the message of Job with my next two posts. My wife and I celebrated our wedding anniversary two days ago. We took a mini-vacation over this past week end and it gave me some time to reflect concisely on what it means to marry in Christ. First, marriage involves a covenant relationship that is divinely sanctioned and legally recognized by society. From a biblical perspective, marriage was established in the Garden of Eden, as Genesis 2 teaches. As such, it is a creation ordinance that transcends both Old and New Testaments. When my wife and I married, we entered into a covenant relationship that is divinely instituted. If we synthesize a number of biblical texts, such as Genesis 2:24, Proverbs 2:17 and Malachi 2:14, we left father and mother and were united in the marriage covenant. Second, Christian marriage is not just a divinely-instituted relationship between two people of the opposite gender, but one that is in Christ. 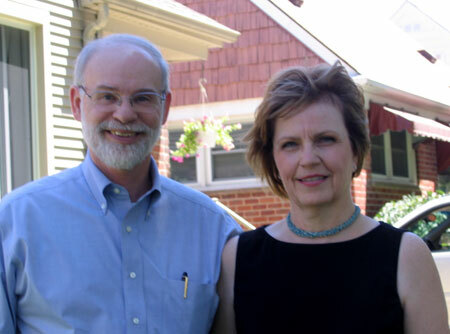 When Linda and I were married 37 years ago, we married in Christ. We began a marriage relationship that has Christ as the Lord who writes the rules and governs the marriage. However, even for two Christians, marriage is hard because the marriage covenant still involves two people who are marred by their depravity. As I look back at the early part of our marriage, I began marriage with a certain level of sinful naiveness about the solemnity of the marriage covenant. As sinners in a Christian marriage, we should not be surprised at our own sin or the sin of our spouse. As believers, we candidly confess our sins to God and to our spouses. Only God knows how many times that I have confessed my own sin to God and my wife. Because marriage is in Christ, we have hope of persevering in marriage. Thank God for his grace in marriage for if he leaves us to ourselves, we would ruin a marriage. Even in marriage, it is all of grace. Third, I thank God for the many years that God has given my wife and I to serve him together. It has been great to see God’s sanctifying work in our marriage. Though we have experienced ups-and-downs in 37 years of marriage, I can see that in the midst of the good, bad and ugly of life God has been at work. As I ponder the significance of 37 years of marriage, I am thankful for God’s grace in Christ for our marital relationship for “it is from him and through him and to him are all things. To him be glory forever. Amen” (Rom 11:36). How would you like to get a pickup truck & an AK-47? A Missouri car dealer, Mark Muller, put a CNN reporter in her place. If you are doing as much as possible to keep the Obama administration from robbing us of our constitutionally guaranteed right to keep and bear arms, you will love this short video clip. It is mighty tempting to go to Missouri and get a truck and an ak-47.